Cass and Flint are back for the second phase of their weird and wild adventures that blur the line between human and animal. Whether dealing with classic schoolyard peer pressure or fighting were-jackals, the brother and sister are up for a challenge, and this time they're getting plenty of help from their friends...and even from a former rival or two? Things sure change fast around Attic High! 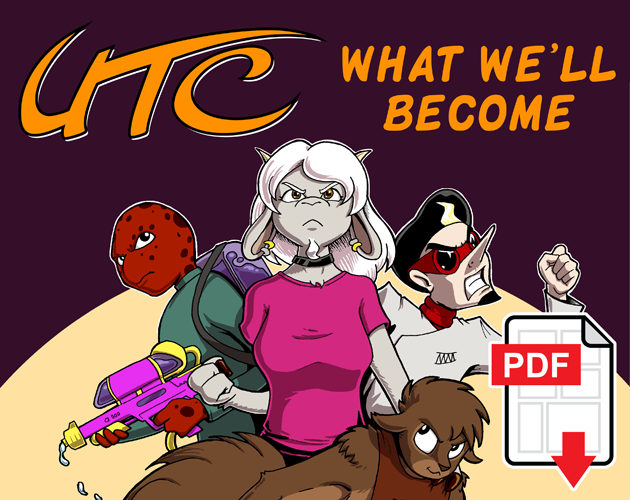 This 176-page PDF collects Chapters 5-10 of the webcomic UTC, from "I, Abomination" to "Class Warfare" Part I -- plus three bonus short stories; two of which aren't available online.